^ 1.00 1.01 1.02 1.03 1.04 1.05 1.06 1.07 1.08 1.09 1.10 1.11 Database entry for Sirius A, SIMBAD. Accessed online 2007-10-20. See: Tayler, Roger John. The Stars: Their Structure and Evolution. Cambridge University Press. 1994: 16. ISBN 0521458854. ^ 8.0 8.1 8.2 Adelman, Saul J. The Physical Properties of normal A stars. Proceedings of the International Astronomical Union. Poprad, Slovakia: Cambridge University Press: 1–11. July 8–13, 2004 [2007-07-03]. ^ From L=4πR2σTeff4. See: Tayler, Roger John. The Stars: Their Structure and Evolution. Cambridge University Press. 1994: 16. ISBN 0521458854. ^ Database entry for Sirius B, SIMBAD. Accessed on line 2007-10-23. ^ Ovid. Fasti IV, lines 901-942. ^ Huggins, W. Further observations on the spectra of some of the stars and nebulae, with an attempt to determine therefrom whether these bodies are moving towards or from the Earth, also observations on the spectra of the Sun and of Comet II. Philosophical Transactions of the Royal Society of London. 1868, 158: 529–564. doi:10.1098/rstl.1868.0022. ^ F. W. Bessel, communicated by J. F. W. Herschel. On the Variations of the Proper Motions of Procyon and Sirius. Monthly Notices of the Royal Astronomical Society. December 1844, 6: 136–141. ^ Camille Flammarion. The Companion of Sirius. The Astronomical Register. August 1877, 15 (176): 186–189. ^ Benest, D., & Duvent, J. L. Is Sirius a triple star?. Astronomy and Astrophysics. July 1995, 299: 621–628 [2007-02-04]. For the instability of an orbit around Sirius B, see §3.2. ^ Bonnet-Bidaud, J. M.; Colas, F.; Lecacheux, J. 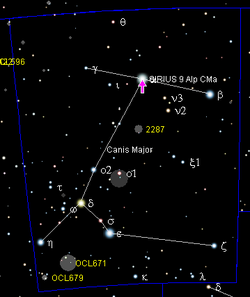 Search for companions around Sirius. Astronomy and Astrophysics. August 2000, 360: 991–996 [2007-10-13]. ^ W. S. Adams. The Spectrum of the Companion of Sirius. Publications of the Astronomical Society of the Pacific. December 1915, 27 (161): 236–237. doi:10.1086/122440. ^ Holberg, J. B. How Degenerate Stars Came to be Known as White Dwarfs. Bulletin of the American Astronomical Society. 2005, 37 (2): 1503 [2007-05-15]. ^ R. Hanbury Brown and R. Q. Twiss. Interferometry of the Intensity Fluctuations in Light. IV. 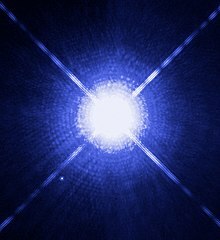 A Test of an Intensity Interferometer on Sirius A. Proceedings of the Royal Society of London. 1958, 248 (1253): 222–237 [2006-07-04]. ^ Dwayne Brown, Donna Weaver. Astronomers Use Hubble to 'Weigh' Dog Star's Companion. NASA. December 13, 2005 [2007-10-13]. ^ McGourty, Christine. Hubble finds mass of white dwarf. BBC News. 2005-12-14 [2007-10-13]. ^ Peter Bond. Astronomers Use Hubble to 'Weigh' Dog Star's Companion. Royal Astronomical Society. 2005-12-14 [2006-08-04]. （原始内容存档于2012-04-19）. ^ M. A. Barstow, Howard E. Bond, J. B. Holberg, M. R. Burleigh, I. Hubeny, and D. Koester. Hubble Space Telescope spectroscopy of the Balmer lines in Sirius B. Monthly Notices of the Royal Astronomical Society. 2005, 362 (4): 1134–1142 [2007-10-13]. doi:10.1111/j.1365-2966.2005.09359.x. ^ Whittet DCB. A Physical Interpretation of the ‘red Sirius’ Anomaly. Mon. Not. R. Astron. Soc. 1999, 310: 335–39. doi:10.1046/j.1365-8711.1999.02975.x. ^ 江晓原. 中国古籍中天狼星颜色之记载. 天文学报. 1992, 33 (4) （中文）. ^ Xiao-Yuan Jiang. The colour of Sirius as recorded in ancient Chinese texts. Chinese Astronomy and Astrophysics. April 1993, 17 (2): 223–228. doi:10.1016/0275-1062(93)90073-X. ^ Schlosser W, Bergmann W. An early-medieval account on the red colour of Sirius and its astrophysical implications. Nature. November 1985, 318 (318): 45–46 [2008-01-11]. doi:10.1038/318045a0. ^ McCluskey SC. The colour of Sirius in the sixth century. Nature. January 1987, 318 (325): 87 [2008-01-11]. doi:10.1038/325087a0. ^ van Gent RH. The colour of Sirius in the sixth century. Nature. January 1987, 318 (325): 87–89 [2008-01-11]. doi:10.1038/325087b0. ^ 49.0 49.1 Whittet DCB. A physical interpretation of the 'red Sirius' anomaly. Monthly Notices of the Royal Astronomical Society. 1999, 310 (2): 355–359 [2007-06-30]. doi:10.1046/j.1365-8711.1999.02975.x. 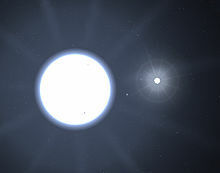 ^ The Dog Star, Sirius, and its Tiny Companion. Hubble News Desk. 2005-12-13 [2006-08-04]. ^ Espenak, Fred. Mars Ephemeris. Twelve Year Planetary Ephemeris: 1995-2006, NASA Reference Publication 1349. （原始内容存档于2008-02-09）. ^ Espenak, Fred. Mercury Ephemeris. Twelve Year Planetary Ephemeris: 1995-2006, NASA Reference Publication 1349. （原始内容存档于2008-03-07）. ^ Darling, David. Winter Triangle. The Internet Encyclopedia of Science. [2007-10-20]. ^ Henshaw, C. On the Visibility of Sirius in Daylight. Journal of the British Astronomical Association. 1984, 94 (5): 221–222 [2007-10-20]. ^ Two full 50.09 yr orbits following the periastron epoch of 1894.13 gives a date of 1994.31. ^ Mullaney, James. Orion's Splendid Double Stars: Pretty Doubles in Orion's Vicinity. Sky & Telescope. March 2008 [2008-02-01]. ^ 60.0 60.1 Henry, Dr. Todd J. The One Hundred Nearest Star Systems. RECONS. 2006-07-01 [2006-08-04]. （原始内容存档于2007-11-12）. ^ The Brightest Stars. Royal Astronomical Society of New Zealand. [2007-12-14]. （原始内容存档于2013-02-14）. ^ 62.0 62.1 62.2 62.3 Sirius 2. SolStation. [2006-08-04]. ^ Angrum, Andrea. Interstellar Mission. NASA/JPL. August 25, 2005 [2007-05-07]. ^ Pedro, Braganca. The 10 Brightest Stars. SPACE.com. 2003-07-15 [2006-08-04]. ^ Imamura, James N. Cooling of White Dwarfs. University of Oregon. 1995-10-02 [2007-01-03]. （原始内容存档于2007-05-02）. ^ Siess, Lionel. Computation of Isochrones. Institut d'Astronomie et d'Astrophysique, Université libre de Bruxelles. 2000 [2007-03-24]. （原始内容存档于2011-05-05）. ^ Palla, Francesco. Stellar evolution before the ZAMS. Proceedings of the international Astronomical Union 227. Italy: Cambridge University Press: 196–205. May 16–20, 2005 [2007-03-24]. ^ The life and times of Sirius B, Ken Croswell, Astronomy, online, 2005-07-27. Accessed 2007-10-19. ^ Eggen, Olin J. The Sirius supercluster in the FK5. Astronomical Journal. 1992, 104 (4): 1493–1504 [2007-11-22]. doi:10.1086/116334. ^ Olano, C. A. The Origin of the Local System of Gas and Stars. The Astronomical Journal. 2001, 121: 295–308 [2007-12-11]. doi:10.1086/318011. ^ Staff. Sirius. Britannica Online Encyclopedia. 2007 [2007-09-10]. ^ An-Najm (The Star), Surah 53. Translations of the Qur'an. University of Southern California, Center for Muslim-Jewish Engagement. 2007 [2009-08-08]. （原始内容存档于2009-02-19）. ^ Subhash Kak. Indic ideas in the Greco-Roman world. （原始内容存档于2010-07-29）. ^ Shri Shri Shiva Mahadeva. （原始内容存档于2007-11-03）. ^ Agrippa, Heinrich Cornelius. De Occulta Philosophia. 1533. ^ Ridpath, Ian. Investigating the Sirius "Mystery". Committee for Skeptical Inquiry. 1978 [2007-06-26]. （原始内容存档于2003-02-17）. ^ de Montellano, Bernard R. Ortiz. The Dogon Revisited. [2007-10-13]. （原始内容存档于2013-02-15）. ^ Coppens, Philip. Dogon Shame. [2007-10-13]. （原始内容存档于2013-02-15）. ^ Apter, Andrew. Griaule’s Legacy: Rethinking “la parole claire” in Dogon Studies (PDF). Cahiers d’Études africaines. 1999, 45 (1): 95–129 [2008-04-16]. ^ About Macquarie University — Naming of the University. Macquarie University official website. Macquarie University. 2007 [2007-12-27]. （原始内容存档于2007-12-14）. ^ van der Linden, FR. Lockheed 8 Sirius. Smithsonian: National Air and Space Museum - Official Website. Smithsonian Institute. 2000 [2008-01-26]. （原始内容存档于2008-01-05）. ^ Mitsubishi Motors history. Mitsubishi Motors - South Africa Official Website. Mercedes Benz. 2007 [2008-01-27]. （原始内容存档于2007-04-04）. ^ Sirius Satellite Radio, Inc. - Company Profile, Information, Business Description, History, Background Information on Sirius Satellite Radio, Inc. Net Industries, LLC. [2008-01-22]. ^ Kopel, Dave. Deconstructing Rowling. National Review Online. 2003-06-09 [2008-02-28]. ^ Paul McEnery. Karlheinz Stockhausen. Salon.com. 2001-01-16. （原始内容存档于2008-06-24）. ^ Beam me up, Stocky. The Guardian. 2005-10-13.